Hi there! How’s everyone doing on Saturday? 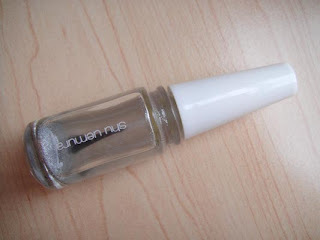 Today’s Color of the Week, I’m going to show you the Shu Uemura Nuance Top Coat Clear nail polish. I think Shu still carries this item as their regular. The outside packaging is a clear plastic box which isn’t the prettiest. The bottle itself is in an odd shape, flat on the back and round in the front. 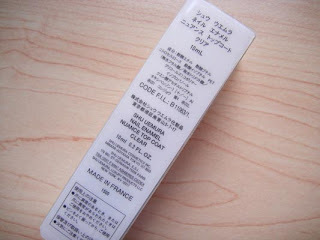 The bottle is kind of small, only 10ml compared to Chanel’s 13ml, but it’s Made in France. The interesting thing about this is that it’s a top coat that consists of two layers, a transparent polish layer and a holographic glitter layer. After sitting for a long time, it’ll look like this, all the glitters sinking at the bottom. So you can just use it like so as a regular top coat. Or… shake it up and transform! Apply it on top of any nail polishes for added glamor. 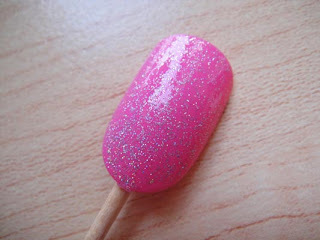 Here I apply it on the Chanel Organdy nail I did several weeks ago. 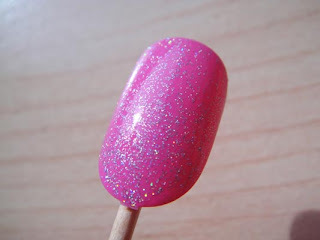 One thing with these glitter polishes is that they don’t feel smooth without some additional top coat or ridge filler. But nothing major. the sharp pink purple is gorgeous! the glitter is really cute!